Take off for a wild ride with the Safari Truck with Lions. Use the open sunroof to get a good look at the animals from a safe distance! The included cable winch comes in handy during tricky situations. Use it to move trees or pull the truck out of muddy areas. Open the rear doors to store supplies in the trunk or remove the roof for easy access to the interior. Having car troubles? No problem! Lift up the hood to find what's wrong and fix it. Truck seats up to four figures. Use the trailer hitch to hook up trailers from other Playmobil sets. Set includes two figures, two lions, gas and water cans, shovel, spare tire, and other accessories. 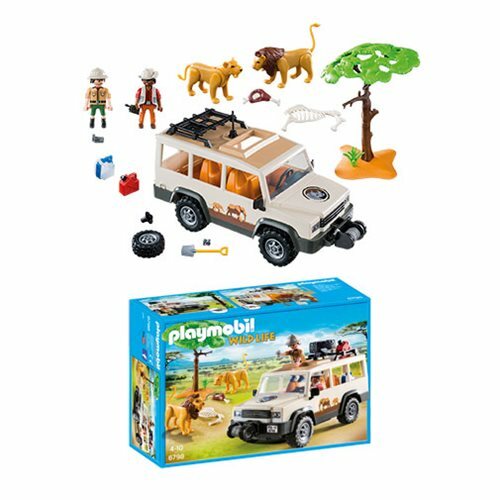 For added fun, get this truck moving by combining it with the Playmobil Remote Control Set 2.4GHz (sold separately). Recommended for ages four to ten. Warning. Choking Hazard. Small parts. Not for children under 3 years. Ages 4-10.